Sometimes at competitions the right conditions just don’t turn up when they’re needed. This was the case for the NSW Wavesailing Titles, yet the event will still be etched in the minds of its competitors; a great social scene was at hand, with four days of great nights, engaging conversations and an all-round good time off the water. In the in the lead up to the event, a solid north-east wind was forecast for the event’s first three days, and a southerly was predicted for the Sunday creating as sense of anticipation in competitors from everywhere in the state and even further away. Unfortunately a forecast does not always eventuate and organisers and competitors are left to deal with the nowcast. 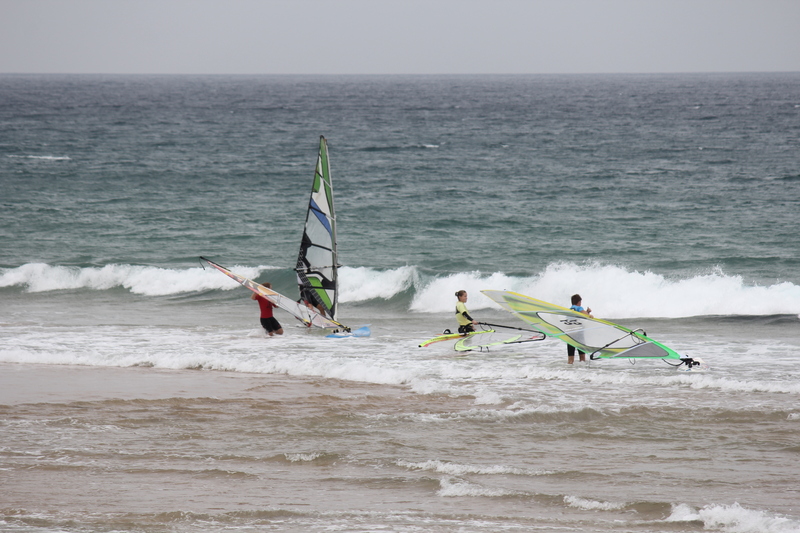 On the Thursday, light winds and small waves presented themselves to competitors at Gerroa. Eventually the wind built up to a strength deemed contestable and the single elimination could get underway. Competitors were judged on what they could do in the conditions available and Jessica Crisp and Alex Halank soon won the Women’s and Juniors’ division respectively by tearing up the conditions available. Jessica Crisp on her way to winning the ladies’ single elimination. In the opens, Brett Goodwin stood out while freesailing, making the conditions look very good, almost landing a number of wave 360 and goiter attempts, enticing many sailors into the water. Unfortunately for Goodwin, he was knocked out of the competition by Forrest Ladkin in one of the heats of the day. Ultimately it came down to Gerroa local Forrest Ladkin and Wanda beach regular Brien Cummings who competed on his own sails. The final was hard-fought and a close affair with the two sailors left inseparable, even after a countback. As a result of this, it was announced the two competitors would compete in a second final later in the competition window. The masters’ division was also a case of Wanda versus Gerroa, with the final being contested by Stephen Robinson and Warren Holder. In deteriorating conditions Holder showed why he is called ‘One Knot’ by getting some nice waves to win the final of the single elimination. At the completion of the single elimination rounds, the competition was adjourned for the rest of the day, with a plan to resume competition at Werri beach. 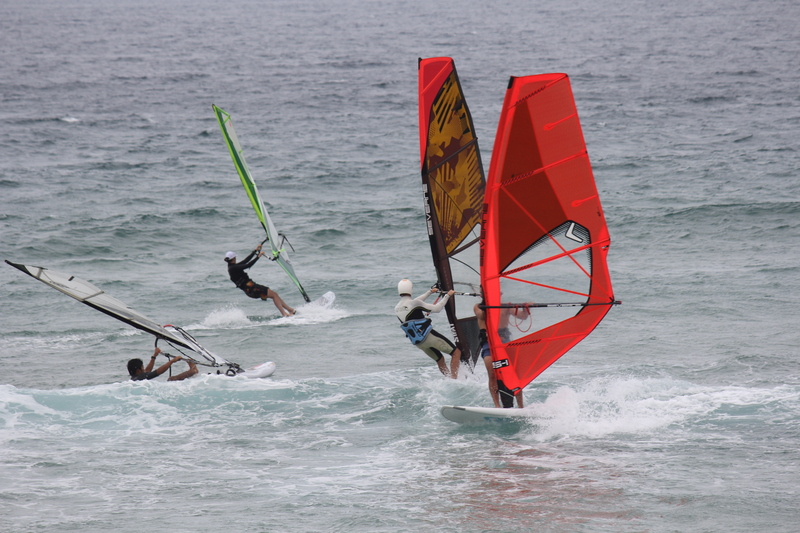 On Friday the competition was moved to Werri beach which was expected to pick up more swell. This turned out to be a good call with 1-2ft waves coming in to be ridden. The wind was light and cross-shore, similar in strength to the previous day. Competition was called on after Brett Goodwin and Steve Robinson each nailed forward loops out the back. The first order of the day was running the double eliminations for the women’s and juniors’ divisions in which the results were relatively unchanged with Jessica Crisp and Alex Halank winning their respective divisions. Next up was the open’s single elimination final replay. Like the first-run final, the ensuing replay was also very close. Both Brien Cummings and Forrest Ladkin showed that they had the skills to rip in mediocre conditions, however it was Cummings with his incredible smacks in the difficult conditions who came out on top. After the completion of the open’s final rerun, the double eliminations for the open’s and masters’ division commenced, and some of their initial heats were ran before competition was ended for the day. The third saw some larger waves at Werri, and some strong, 15-20 knot puffs of cross off wind fill in. However this wind proved to be too inconsistent and only two heats were ran, but there was some fun freesailing to be enjoyed. The day’s fun however peaked later on, with a social evening being held. The night had a great atmosphere with a large number of like minded wavesailors conversing, watching the one of the latest windsurfing films, enjoying some home-cooked lasagne and receiving prizes. Thanks to the generosity of our sponsors Hot Sails Maui – Australia, ION, K4 Fins, WindSurfnSnow, Natural Necessity and Severne Sails, there were a huge amount of prizes to give out, including K4 fins, ION wetsuits and harnesses and the main prize of a Hot Sails Maui KS3 which was won by Zack Coleman – just by showing up to the event. The final day of the event window looked like it could be perfect. The forecast was for a solid southerly and some decently-sized swell. On arrival at Windang, where the competition was to be based, the wind had not yet filled in, but there was a large north-east swell generating some great waves which a number of competitors took advantage of on their surfboards. Gradually the wind started to build and sailors started to rig anticipating some good sailing. A few sailors even tested out the conditions including Koichi Kaneda and Jessica Crisp on her Hot Sails KS3. Unfortunately, despite the competition nearly being called on, the wind never got to a contestable strength and towards the end of the day, the judges called off the day’s sailing, officially ending the competition and making the single elimination results final for the masters’ and open’s divisions. The feedback from competitors about the event was very positive, with all competitors having a good time and enjoying the occasion.